Originally from NYC, Lynn graduated from Pratt Institute. 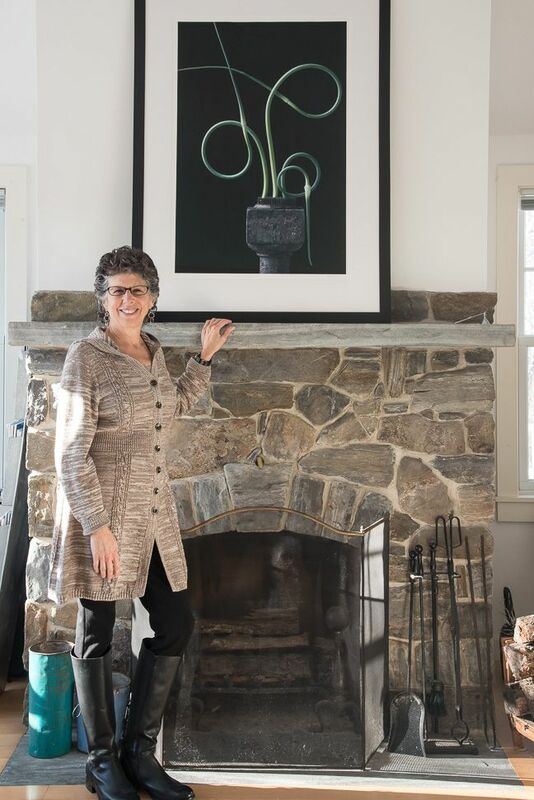 She lived the farm-to-table experience for 8 years after moving to a farm in Maine in 1983 and photographing her life living with the seasons. She has an impressive list of employers and clients over her four-decade career shooting fashion for WWD and W as the first woman staff photographer, as well as photographing gardens, food and interiors for Country Living magazine, House Beautiful, The New York Times Magazine, New York Magazine, Coastal Living, Gourmet, Design New England, BH&G, Garden Design, Organic Gardening, British Gardens Illustrated, Rizzoli Books, The Clean Program, L.L.Bean, Swans Island Company, Rockport Granite, Maine Boats, Homes & Harbors, Taproot, The Table and Zest magazine. Sole photographer of three award winning garden/lifestyle books, she now adds fine art photography to the mix and works with clients in the food world. Lynn's body of work is purely personal. It is about the obvious but often overlooked beauty of the harvest. Visits to photograph at local Maine farmer's markets took a new direction when she brought a stunning purple cauliflower back to her studio and placed it on an old white pedestal by an east-facing window, honoring vegetables by literally placing them on a higher level. Lynn triumphs in showing her reverence for the remarkable colors and forms in the garden. "The Pedestal Series" and "The Tray Series" evoke, through beauty that is also sustenance, a sense of connectedness to this planet. She has also added simple man-made kitchen objects in her still lifes again showing good design can be found everywhere if you take the time to really look. Lynn's newest portrait series "Still Lives: Stories in Profile" takes on human subjects this time and shows the side that is often not seen and observed- the profile. "Photographing a person in profile is like discovering that person all over again." Lynn's limited edition prints are available at galleries and select shops and are held by corporate and private collectors throughout the US and Europe. Maine Farm, A Year of Country Life, written by Stanley Joseph; Random House. 2017- 2nd Robert Cornelius Portrait Award; Runner Up. 2016- 8th Edition Julia Margaret Cameron Award; Winner in Fine Art Category. 2015- 10th Annual Black & White Spider Awards; Outstanding Achievement in the Still Life Category. 2015- Garden Writers Association; Gold Award for Best Photography. 2015- 7th Edition Julia Margaret Cameron Award; Winner in Still Life & Abstractions Category. 2015- 7th Pollux Awards; Runner- up, Still Life category. 2015- Griffin Museum of Photography's 21st Juried Exhibition; Winchester, MA. 2015- International Color Award; Honorable Mention; Food. 2015- ArtForward; Bronze Award Winner. 2014- London International Creative Competition Honorable Mention. 2014 - The Center for Fine Art Photography; Fort Collins, Colorado; International Still Life Competition; Best of Show. 2013 - San Francisco International Photography Exhibition, Gallery Photographica; Gold Medal Winner. 2013 - Photo District News, Objects of Desire; Food and Still Life Category. 2013 - Garden Writers Association Media Awards, Silver Awards of Achievement for Photography in 4 categories. 2012 - Merit Award, Color + B/W Magazine. "The Pedestal Series" and the "Still Lives" series, a fine art series is sold in three limited edition sizes, framed or unframed. "The Tray Series" is sold as an open edition. The photographs are professionally printed and framed using the finest archival materials. For availability of prints, pricing, purchasing and to see additional images, please give us a call at 207-338-4814 or email lynn@lynnkarlinphoto.com. We'd be happy to work with you. 9 x 9, 15 x 15, 20 x 20, 26 x 26, 34 x 34. Photographs are also available as dye-infused aluminum prints. Maine Farmland Trust - Belfast, Maine. Kingman Gallery - Deer Isle, Maine. Leslie Curtis Designs - 10 Bayview Street; Camden, Maine. 4th Biennial Fine Art & Documentary Photography; Berlin, Germany; 2016. Maine Farmland Trust, Belfast, Maine; Solo Show; October 2016. Griffin Museum of Photography's 21st Juried Exhibition; Winchester, MA. ; 2015. Kingman Gallery, Deer Isle, Maine; "Inspired from Nature"; Solo Show; 2015. Islesford Dock Restaurant & Gallery; Little Cranberry Island, Maine; 2015. Vox Photographs; Portland, Maine; "Natural"; 2015. The Center for Fine Art Photography; Fort Collins, Colorado; International Still Life Competition; Best of Show; 2014. Maine Farmland Trust Gallery, solo show; "Natural Beauties"; Belfast, ME. ; 2014. James Beard House Greenhouse Gallery, NYC; 2013. San Francisco International Photography Exhibition, Gallery Photographica; 2013. Ethel H. Blum Gallery, College of the Atlantic; Bar Harbor, Maine; 2011. Palmina F. & Stephen S. Pace Galleries of Fryeburg Academy - Fryeburg, Maine; 2012. George Marshall Store Gallery, York, Maine; 2012. Anita Pegnini-Raber Gallery, Rehoboth Beach, DE. ; 2011. Hammertown stores and galleries, Rhinebeck & Pine Plains, New York; 2010. Carver Hill Gallery, Rockport, Maine; 2010. All photographs on this site are the sole property of lynnkarlinphoto.com. For licensing terms or other information please give us a call.